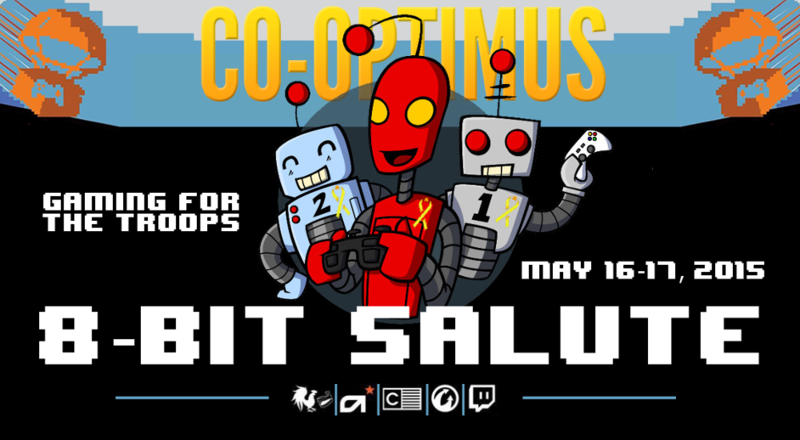 Co-Optimus - News - 8-Bit Salute Starts Tomorrow - Play With Us! 8-Bit Salute Starts Tomorrow - Play With Us! Tomorrow, at 8AM Central, we're starting our 24-hour marathon along with thousands of others for 8-Bit Salute. We'll be playing all day and we'd like to welcome everyone to join us. Our Twitch stream will be here on the front page of Co-Optimus, but you can also watch us on our Twitch page. You can also chat with us there, so feel free to jump in the chat and keep us company! We desperately need your donations! We might have set a lofty goal for our first year, but that's not going to keep us from trying. Our troops need our help. Deployments are really tough on our troops physically, emotionally, and mentally. Could you imagine being 6 months into a soul-crushing deployment in Afghanistan and receiving a huge care package containing an Xbox One and a bunch of games? That must be an incredible feeling. Let's make that a reality for our hard working troops. They deserve need it. Please head over to our team page and make a donation through our page, or one of our team member pages. Even if you can't make a donation right now, that's ok. You can still join us tomorrow either on Twitch, or in-game. If you want to make a donation at another time, you can do that too. We'll accept donations for this event until July, and then we'll launch a new campaign. Hope to see you tomorrow!